Hurricane Michael has grown into a Category 4 hurricane, with sustained winds reaching 130 mph, as it barrels toward northwestern Florida, making it a much stronger storm than Hurricane Florence was when it made landfall as a Category 1 storm drenching the Carolinas last month, according to the National Hurricane Center. Forecasters say Michael will come ashore over the Florida Panhandle sometime midday Wednesday. 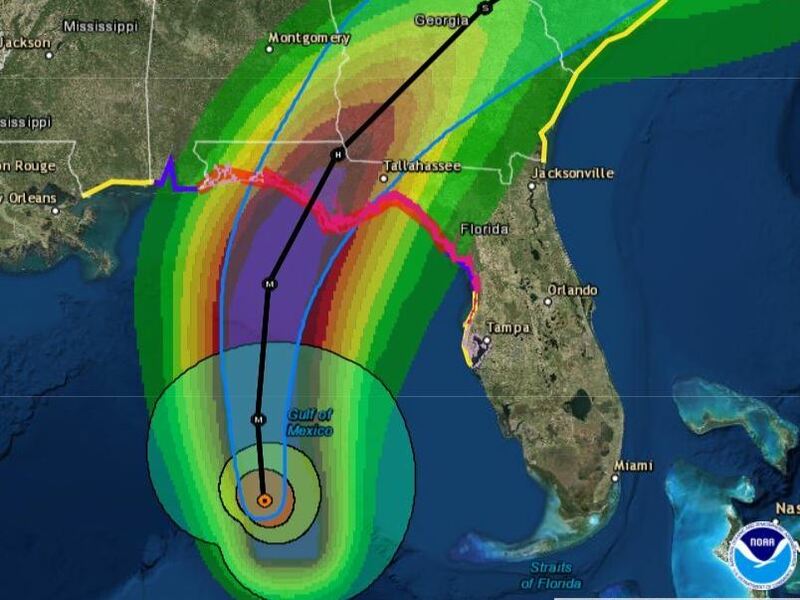 Michael is forecast to be the most destructive storm to hit the Panhandle in decades. It's expected to cause life-threatening flash floods and send surges of ocean water into coastal areas along the Gulf, from Pensacola around the coast to Tampa. The storm's rapid intensification over the past two days, despite shifting winds, "defies traditional logic," according to hurricane forecasters. 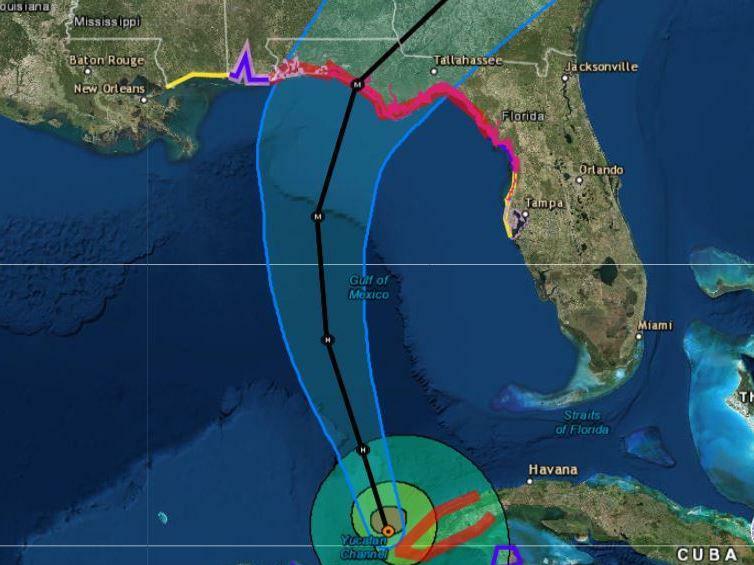 The latest advisory said Michael was located 180 miles south-southwest of Apalachicola, Fla., moving northward at 12 mph. It warned of life-threatening storm surges, hurricane force winds and heavy rainfall. There are warnings for more than 300 miles of coastline. It's forecast to be a large and dangerous hurricane at landfall. "Today is the day. We need to be ready for this," NHC Director Ken Graham said in an update Tuesday morning, urging people in the storm's path to finish preparations and evacuate if they're in an emergency area. The National Hurricane Center has enacted hurricane, tropical storm and storm surge warnings for more than 300 miles of the Florida coast. Coastal counties began issuing evacuation orders and opening emergency shelters at schools on Sunday, as member station WFSU reports. Wakulla County issued a dire warning, saying it won't open any of its shelters — because they're safety-rated only for storms up to Category 2 strength, WFSU reports. "The center of Michael will continue to move over the southern Gulf of Mexico this morning, then move across the eastern Gulf of Mexico later today and tonight," the agency said. 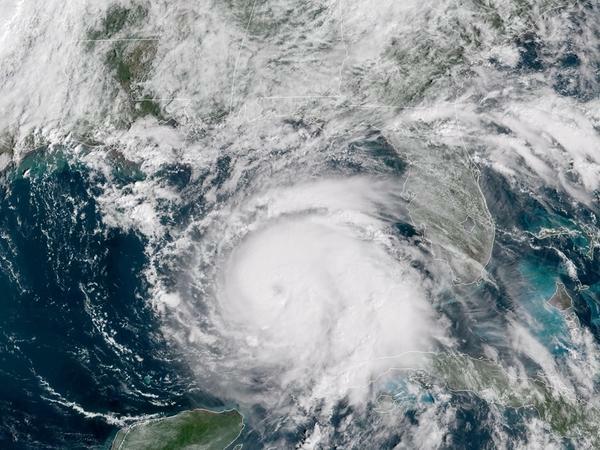 The storm's center is expected to move inland over the Florida Panhandle or Florida Big Bend area before moving northeastward across the Southeastern U.S.
Hurricane Michael is expected to be a major storm when it arrives at Florida's Gulf Coast on Wednesday. After moving ashore, it will head northeastward toward Georgia and South Carolina. Everyone in hurricane and storm surge warning zones should prepare for life-threatening winds, the NHC said. As Michael moves inland, southern Georgia and southeastern Alabama can expect damaging winds, too. "Hurricane Michael is a monstrous storm," said Florida Gov. Rick Scott, at a Tuesday news conference, adding that it could bring "total devastation to parts of our state, especially in the Panhandle." President Trump has approved Florida's declaration of emergency. "As Hurricane Michael nears landfall, we are working with state and local officials in Florida to take all necessary precautions," Trump said Monday. "It looks like another big one." FEMA is already on the ground in Florida; other federal agencies are also preparing to assist people in the storm's path. The governor activated 750 National Guardsmen for storm response on Monday, on top of the 500 activated the day before. The Florida National Guard has over 4,000 more Guard members available for deployment, Scott said. The NHC says some coastal regions can expect 9 to 13 feet of storm surge, as the hurricane's winds drive a wall of water onto the low-lying shore. Panama City could see a storm surge at depths from 6 to 9 feet. But the surging seawater could also create perilous problems far from the coast, raising rivers and bays to dangerous levels as it pushes as much as 10 to 15 miles inland. "The storm surge is absolutely deadly. Do not think you can survive it," Scott said. The governor has declared a state of emergency in 35 counties and is stressing that residents should "absolutely" evacuate if ordered to. "Think about what we've seen before with storms like Hurricane Irma," he said. More than 80 deaths were linked to that storm, according to The Associated Press — including residents of a nursing home. With a number of counties ordering evacuations, Scott waived highway tolls in the northwest part of the state. After it makes landfall, the storm is predicted to pass into Georgia, where Gov. Nathan Deal on Tuesday issued a state of emergency covering 92 counties — nearly the entire lower two-thirds of his state. For residents who want to leave, local authorities are stressing timely evacuation, too. "Storm surge is the No. 1 problem that you can see from these storms. You have rain, you have wind — but storm surge, that's a lot of water that can come onshore," said David Peaton, the assistant director of emergency management in Levy County, in an interview with local station WUFT. Peaton says he is working closely with the National Weather Service to provide accurate information and protective measures to his county, which faces the Gulf of Mexico and is especially vulnerable to any flooding produced by Michael. Levy County has closed its schools through Thursday; Florida State University, in Tallahassee, has closed as well. Both Peaton and Scott encourage residents to have at least three days' worth of food and supplies and to check on their neighbors and monitor local news coverage. Citing data from aircraft that flew in the storm, the hurricane center says Michael is becoming better organized and symmetrical as it moves north. Both NOAA and Air Force Reserve Hurricane Hunter aircraft have flown through the hurricane's four quadrants — and the NHC says, "The planes actually passed through the eye around the same time [Tuesday morning], and reported that they could see one another." Tallahassee International Airport ‏is suspending commercial flight activity as 12:01 a.m. ET on Wednesday but expects to resume activity on Thursday. Florida Fish and Wildlife has put 40 additional law enforcement officers on notice to deploy with a variety of special equipment, including boats that can be used for high-water rescues. The National Hurricane Center says Michael is expected to move off the mid-Atlantic coast and head back out to sea on Friday. Hurricane Michael is forecast to be one of the most destructive storms to hit the Florida Panhandle in decades. It could send life-threatening surges of ocean water to coastal areas throughout the state. NPR's Emily Sullivan reports state and local governments are preparing for torrential downpours. EMILY SULLIVAN, BYLINE: Hurricane Michael will likely make landfall along the Gulf Coast today as a Category 3 storm, according to the National Hurricane Center. The agency said the storm's steady intensification over the past two days despite shifting westerly winds defies traditional logic. They anticipate torrential rains and winds of upwards of 120 miles per hour. RICK SCOTT: Hurricane Michael is a massive storm that could bring total devastation to parts of our state, especially in the Panhandle. SULLIVAN: That's Florida Governor Rick Scott. Scott says he spoke to President Trump on Monday afternoon. He's committed to providing any federal resources Florida may need. FEMA is already on Floridian ground providing assistance in the form of the EPA, Homeland Security and Health and Human Services. The National Hurricane Center has hurricane, tropical storm and storm surge warnings for more than 300 miles of coast. They say these regions can expect eight to 12 feet of storm surge. SCOTT: That means the water will come miles inshore and could easily rise over the roofs of houses. SULLIVAN: The governor has declared a state of emergency in 35 counties and is stressing the need to follow any evacuation orders. SCOTT: This storm surge is absolutely deadly. Do not think you can survive it. SULLIVAN: And local authorities are stressing timely evacuation, too. David Peaton is the deputy director of emergency management in Levy County, which faces the Gulf of Mexico. He spoke to WUFT. DAVID PEATON: Storm surge is the No. 1 problem that you could see from these storms. You have rain. You have wind. But storm surge, that's a lot of water that can come onshore. SULLIVAN: Right now he's working to get county residents protective measures before the hurricane makes landfall today. Meteorologists predict that by Wednesday night or Thursday morning, Micheal's rains are likely to spread into the Carolinas and Mid-Atlantic, perhaps bringing more water to areas still recovering from Hurricane Florence.